Ecozoic Living is learning to be present to the planet in a mutually beneficial manner. GO DEEP GREEN an online course for flourishing within the whole community of life on Earth. would learn to be present to the planet in a mutually beneficial manner. To learn more, read The Great Work: Our Way into the Future. Cosmic Person Lucy has added becoming a Certified Nature and Forest Therapy Guide to her skills in healing therapies. There are a few of us cross-pollinating the CoFlourishing & Nature Connection spaces, including Convener Jana Norman. We've formed a collective called Nature & Wellbeing Australia to share the work. 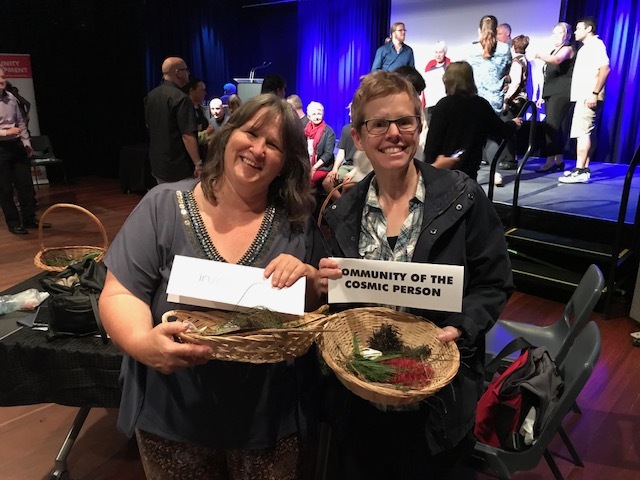 Members of the Community of the Cosmic Person are involved in several projects about local nature connection as part of the Amongst It! grants program. (The projects are: Forest Bathing Walk with the Cancer Care Centre (Bronwyn, Alex, & Jana); Noticing Nature in Morialta (Alex & Jana); Located! Being Onkaparingan (Debbie & Jana, pictured above).